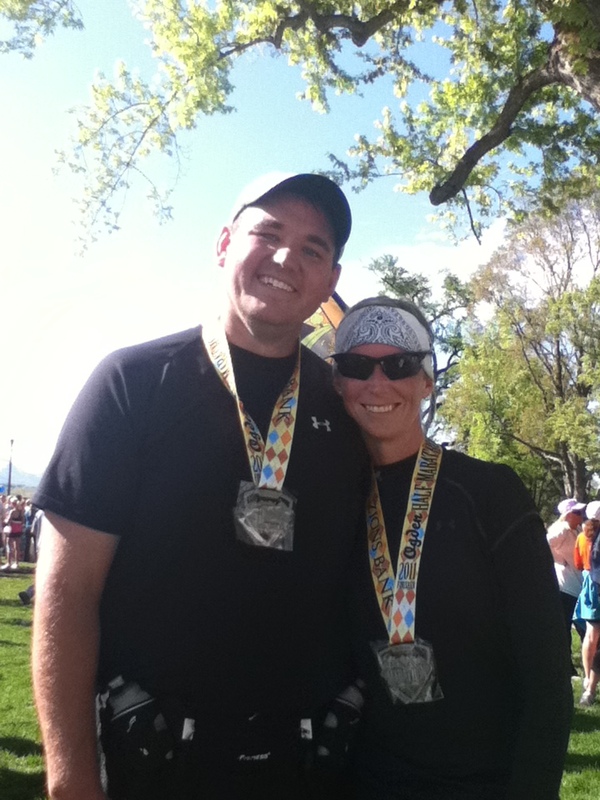 Ogden Half Marathon, Amazing!!! | Todayz Run!!! As always, the alarm is going off at 4:30. My eyes dislike opening at 4:30 very very much!!! And you know what else?? My body dislikes rolling out of bed at 4:37!!! Yep, I hit the snooze button. I was so tempted to hit it a second time, but my sister Keri (my original running partner) was johnny on the spot. So, with a cute sister knocking on my front door, I was out of bed. I had the same dilemma the night before that I always have. Yes……, what the freak should I wear? With the great weather that has been happening here in the great state of Utah. (Oh that just means there is a freakin’ chance of rain at any givin’ moment, so your always in limbo!!! Yeah, I’m happy about it. Nope, I am lying about that part for sure! Hello could we get a bit of sunshine here???) Anyway, after speaking to my cute sisters and the love of my life the night before, I decided on my normal winter racing gear. Really?? Winter racing gear??? Our personal logistics man (PLM) is in charge of seeing that we are to the proper drop off destination on time, and then he drives back down the canyon to make sure that we are properly cheered on at the finish line! Side note: He usually will perform his own little marathon along the way, and will drive or walk to find the peeps in our pack, and then he will run with us for a little bit. This way he knows he is getting his exercise in. Yeah, this is where we get our exercise craziness from, and yes, he is 77 years old!! Just an amazing logistics man to have I think!!! 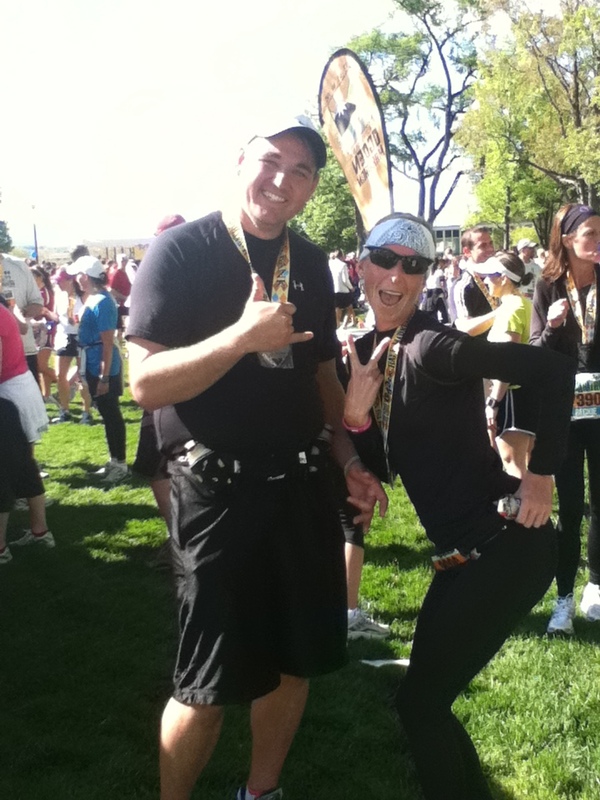 So once my PLM dropped me off at the Half starting line, I was to find……”fifty pounds of fury”, aka: Kim (that would be my small, very feisty sister) She was running the half with me. (The rest of my pack was running the relay. Relay is code for,……..”We run whatever we want to run. You don’t own us. You don’t tell us what to run, we will let you know how this race will work!” Yeah, most of them ended up running a half marathon. Freakin’ rebels are what they are!) Well, I thought I would just walk to the start line, but I knew “fifty” would be in the port-a-potty line, so I went directly there. Surprise!!! Walked right to her. I have some amazing intuition, or my sisters are just potty predictable!!! Okay, okay I am getting to the big show! I just know mile marker one was there before I knew it. I said to “fifty”, Wow! that was a quick mile! And, then we started the only uphill of the course. Then one more quick mile and mile marker two was right there. I was like, Holy crap how fast are we going? I started looking for someone who didn’t already have earphones in, and had their own Coach Garmin. I had to know what was going on here!!! I decided that if my coach passed, I was going to have to take advantage of someone else’s coach. I discovered that we were running just over 7 minute miles, and that was a hair too fast!! However, I felt great. I just wanted to feel great when I finished!! Mile 2-3: This section of the race is just after the uphill, and on the west end of Pineview Reservoir. This is where “fifty pounds of fury” decided that she didn’t choose her attire wisely. I ran by her side and helped her while she did a full fledge top change. Coldgear top and tech-t came off. Tech-t went back on. Coldgear went around her waist. I have to say, even though I helped her with this change, I was still very impressed with the change on the fly!! Mile 4-5: Around the last little corner of the dam, across the spillway, and the start of running down the Weber Canyon. This section is where “fifty” and I were passed by a chica in a pretty cute pink shirt. I however, thought this was an uncalled for passing on this quick downhill section. I decided at that point that that chica was going to be caught!!! It wasn’t going to be a fast attack, but it was going to be an attack!!! Mile 6-7: This is the best course!! It is so beautiful, so green, and the people who live in this area are so supportive. The river is running really high, and it is just amazing to see and be a part of all this active beauty. Mile 8-9: I still see my uncalled for passing chica in her cute pink top. She is coming back to me. I start to sing a little diddy to “fifty”. It went a little something like this, come back to me. I beggin’ ya please. Come back to me. I want you to come back to me! !” And with that “fifty” said to me, “If you are attacking now, you might have to leave me.” I asked her if she was feeling okay, only that I wouldn’t want to leave her if she was not. She gave me the okay, and with that I set my eyes on “Pink Top”! I caught her and passed her with power. Dang it I love this course!! Mile 10-11: Hey, there is the waterfall! (When I ran the full, this is all I wanted to see.) Oh, when did they make the trail go under the street? I obviously was not made aware of this change. Once, I ran under the road on the trail, I had a moment to think about how I love all the trails that are being made for the active. I love that athletes and vehicles don’t have to interact as much these days. This moment took away the weird sensation that my right leg was starting to feel fatigued and my right hip was starting to ache. Mile 11-12: I am on the parkway and I see another pink top. I start talking to myself. No not in a crazy way!! I say, can you get her? Set your eyes on her! Attack!! Okay, that can be viewed as a little crazy, your right! Either way I caught her. At about mile 11.5 my right leg is killing me, and I feel myself slow down for a second. I start some more positive self talk. I tell myself, finish this race strong! Put it all out there. You only have a mile and a little bit left, and this is where my mantra starts. Now prepare yourself, you might not have heard of this one before. It is, scratch, claw, fight!!! (I think I might have started a theme with the whole attack thing). Anyway, I started kind of chanting my mantra in my head and you know what it worked. I picked it up and started with the, scratch, claw, fight….scratch, claw, fight……scratch, claw, fight!! And, peeps started to come back to me one by one. So happy that I can participate in this sport with the love of my life!! Mile 12-finish: I am now on Grant Ave. I can see the finish, but barely. I am tired and my leg is feeling detached, and that I am just swinging it along. I am keeping with my mantra with an added encouraging yell from an amazing spin instructor that I kept in my head from the day before. Scratch, claw, fight!!! Don’t you give up now!!! Scratch, claw, fight!!! Don’t you give up now!! At that point I feel my angel wings from my mama above and I feel like I am flying. Not to be confused with sprinting!!! I had no sprinting in me at that point. I only had “strong finish” in me, and that is what I felt it did!!! What an amazing run!!! This one wins for scenery for sure. The volunteers were awesome and so organized. Thank you volunteers for your cheering, smiles, encouraging words and all-around support. My cute brother Scott. He was part of the "I run whatever I want to run relay team!!" 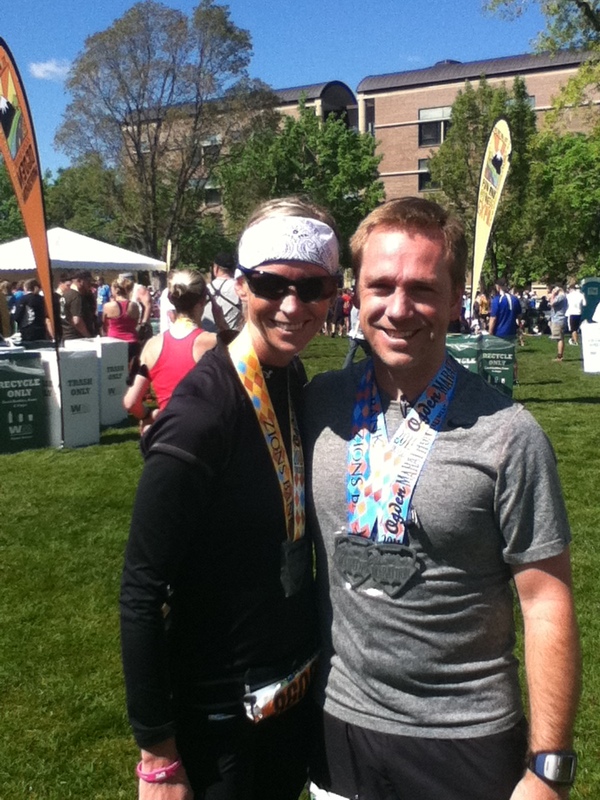 The Ogden Half Marathon needs to be put on your list of races to run every year!!! What I wore: My typical winter racing gear (boo!) Coldgear top and bottom. My cute Todayz Run T that the love of my life had made. iFitness Belt, Ryders Sunglasses, my fave cushy socks, my fave running shoes, and umm….. a badass bandana!! What I wish I had: I just wish all my running peeps could have run the half with me!!! Songsbeing repeated on the iPod: 21 by Adele, Til The World Ends by Britney Spears, and Give Me Everything by Pittbull. This entry was posted in A Runner's Thoughts!, Everyday Running, Half Marathon, Inspiring, Just Exercise, Races, Ramblings and tagged A Runner's Thoughts!, Everyday Running, Half Marathon, Inspiring, Just Exercise, Races. Bookmark the permalink. 2 Responses to Ogden Half Marathon, Amazing!!! It was a great run! I couldn’t have done it without you. I agree with you that we all needed to be running together. More fun!! We have a plan and we will make it happen next year! !